Already a CARVESMART customer? Follow us on Instagram and show us what you're working on! Use #carvesmart in your post! 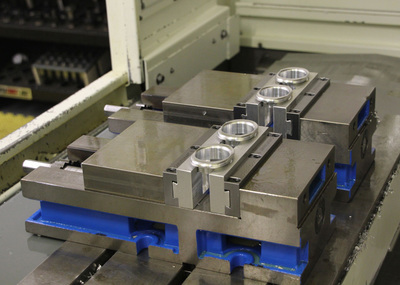 Small Jaws for Small Parts! Long Jaws for Long Parts! 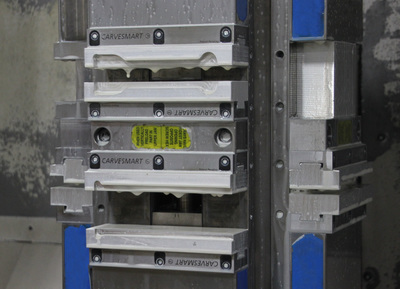 Saw to any length extruded aluminum jaw stock holding four parts in two vises. 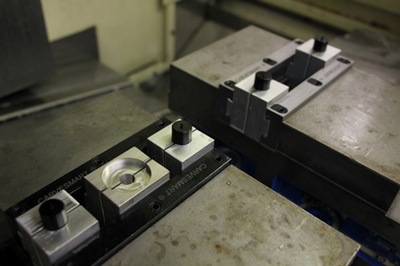 The first vise is set up for two different jobs running simultaneously. 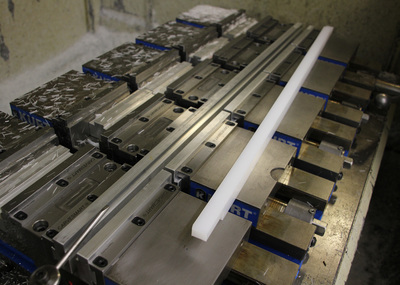 Extruded aluminum jaw stock is available in 31” and 94” lengths. Use one long jaw to tie all your stationary jaws together. Mill a step to square up your vises. 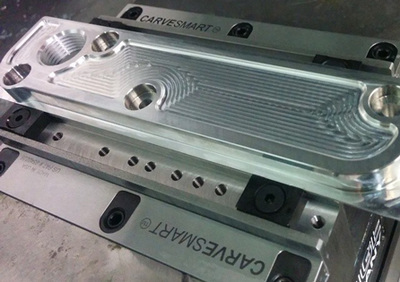 No cap screws allowing a narrower CARVEsmart jaw to hold the same part as a thicker cap screwed jaw, deeper into the sweet spot of the vise, without cap screw interference. All twelve 6” soft jaws were change changed in in 8 minutes. A cutting tool carves the female forms in 5 minutes making them perfect to the spindle. 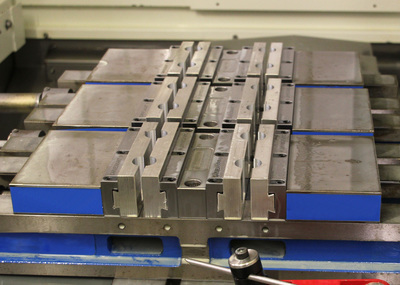 Change all 16 jaws without opening the vises in less than 10 minutes. Recutting the female form makes the set up perfect to the spindle without indicators and offsets. 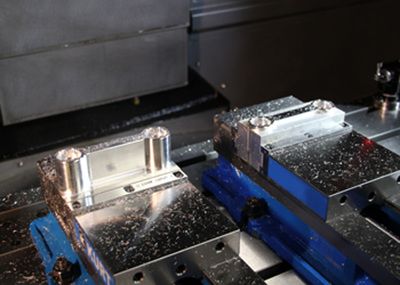 Once carved jaws relocate +/-0.0003” when relocated in the same master jaw. Jaws can be moved in any opening and repeat within 0.001”. 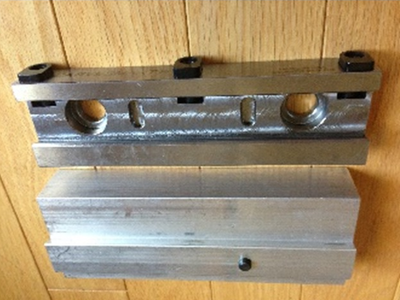 A dovetailed part will maximize your holding above the centerline of the vise. Dovetailed, quick change, edge gripping jaws. Op 1 and Op 2! Quick Change uses Beyond Vises! Operation one on the left is using COMBOjaws on a dovetailed piece of material. 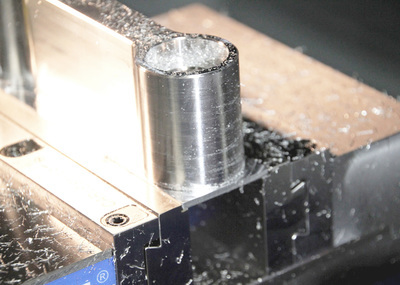 This allows aggressive cuts to rough and stable finishing. Operation two in the second vise has carved female features to hold the part deep in to the sweet spot of the vise. One complete part is achieved for every cycle. 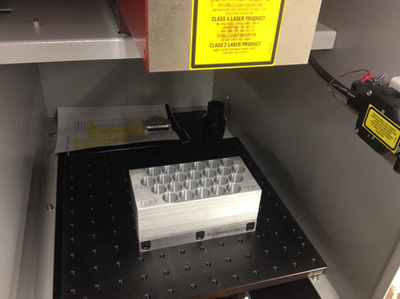 A SMARTstopped master jaw and jaw stock being used for quick changing fixtures in a laser.